The rug is highlighted on a ‘get-the-look’ shopping page that follows a feature about the Danish home of Barbara Husted Werner and her film director husband Martin Werner. 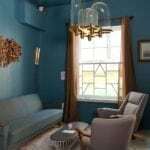 They’ve filled their rooms with a rich variety of Moroccan rugs dotted between striking furniture and lighting from super-contemporary design studios including Aparatus, Piet Hein Eek and Nanna Ditzel. Barbara owns the Copenhagen shop Holly Golightly, which Mette highlighted in her Copenhagen city guide for us here on the blog, and she obviously has an incredible eye for colour – it’s worth picking up a copy of Living Etc just to have a peek at her stunning pink kitchen with its green geometric tiled floor. Seeing the house reminded us that we haven’t talked about our Boucherouites here for a while. Though before we do, we thought you might like to know that we are offering a seasonal reduction of 15% off some of these rugs right now! Boucherouites are the more contemporary rugs in our collection. They emerged in the 1960s, handmade by a younger generation of weavers living a more urban lifestyle in Morocco than the traditional Berber tribes working in the Middle and High Atlas mountains. Not living so close to the sheep and the fields meant that for this new group of weavers wool was a more expensive and inaccessible commodity. 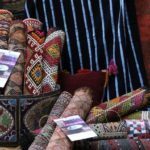 However with rug-making still a large part of their culture, the makers started to look for materials elsewhere, for instance picking up clothing they could find in their local souks. A secondhand pullover would be unravelled, dyed in parts and then used to make a rug. This process explains why Boucherouites are also known as Rag Rugs. Rag Rug weavers not only updated the materials they used for making, but also reinvented motifs and colour ways and quite radically modernised the work process by focussing on their individual design preferences instead of sticking to tribal traditions as the Berber makers had before them. This means each Boucherouite is not only a unique piece of art, but is also extremely personalised. So Boucherouites embody an aesthetic and cultural shift towards Western culture for this group of Moroccan weavers and maybe that’s why the patterns feel so modern to us. They are of course totally in keeping with the current trend for geometric designs in interiors, but crucially they’re also classic and timeless – flick through some back issues of World of Interiors to see them appear in all sorts of homes, classical and contemporary. We love to see them on walls as well as floors – as you might remember us noting before in our feature about Rag Rugs As Art. There’s also something very joyous about seeing a clash of Boucherouite patterns together, even on the page here. We hope it inspires you to mix and match Boucherouites like this throughout your home too. Find an extensive collection of Boucherouites in our 15%-off-Sale here. And don’t forget to send us a photo of your rug at home if you do purchase one, we’re always inspired by how you use our pieces.